After a wild-card weekend marked by upsets, the NFL’s divisional round restored order to the playoffs: The home team won in all four matchups — only the second time that’s happened this decade.1 The resulting conference championship games — Rams vs. Saints and Patriots vs. Chiefs — could be explosive affairs. They feature the four highest-scoring offenses in the NFL this season and a very evenly-matched “final four” that could go down as one of the most exciting ever. Interestingly, each conference championship is also a rematch: The Patriots beat the Chiefs 43-40 in Week 6, while the Saints topped the Rams 45-35 in Week 9. These kind of rematches are more common than we might think — from the advent of the modern playoff format in 1990 through last season, 63 percent of conference championship games featured teams who’d faced off at least once during the regular season.2 And how predictive was the original game? Over the same period of time, the winner of the earlier contest (or contests) also won the conference championship game 63 percent of the time3 (excluding cases in which teams played twice beforehand and split the first two matchups). Kansas City shouldn’t feel too bad about the earlier contest, in which they played the Patriots close to a standstill in Foxborough — especially since, by contrast, Sunday’s game will be held at Arrowhead Stadium. KC only lost on a last-second field goal, was outgained by just 54 yards, and even led New England with as little as 5:25 to go in the game. Patrick Mahomes threw for 352 yards with a 110.0 passer rating,5 although the Chiefs offense was held below its usual EPA output despite a big game (185 scrimmage yards) from the now-departed Kareem Hunt. But if the Chiefs get to 40 points again, particularly in the frigid weather forecasted for Sunday, there probably won’t be many complaints about the offense. The bigger concern for KC might be about its ability to contain New England’s stable of running backs, who generated 173 yards (and 8.9 expected points) on the ground in the first meeting. According to ESPN’s Stats & Information Group, Patriots rookie running back Sony Michel ran for 72 of his 106 yards before first contact in the game — reminiscent of the 70 yards before contact (and 129 overall) he racked up on the Chargers last week. The Patriots then preyed on Kansas City’s inability to stop the run by using play action, where Tom Brady had 140 yards and a season-high 10 completions. The Chiefs are not known for their defense, but even by their standards, the previous meeting was a struggle. Perhaps the presence of KC playmakers such as linebacker Justin Houston and safety Eric Berry (maybe), both of whom missed the earlier contest, will make a difference this time around? Way back in November, the Saints never trailed as they handed Los Angeles its first loss of the season, humbling the Rams’ star-studded defense with its worst performance of the entire year. Now New Orleans will try to make it 2-for-2 against L.A. at home in the Superdome, and the Rams will have a tough time preventing that fate if they can’t slow down Drew Brees, Michael Thomas and the Saints’ passing attack. Brees had 346 yards, 4 touchdowns and a 137.0 passer rating against L.A., with Thomas gaining an incredible 211 yards on 12 receptions. It was the Rams’ third-worst game of the season in terms of generating pressure on an opposing quarterback, and Brees got a season-high 2.45 seconds of time in the pocket per pass, according to ESPN Stats & Info despite facing a blitz 36.8 percent of the time. Against a Rams team that thrives on pressuring the QB6 and forcing mistakes,7 the extra time that Brees had to survey the defense and pick it apart was devastating. The same could be said for Thomas’s ability to gain extra yards after the catch; according to NFL Next-Gen Stats, Thomas picked up 8.7 YAC per reception, or 3.8 more than would be expected based on player-tracking data. (It’s worth noting that Thomas also had a monster game last week against the Eagles, hauling in 12 catches for 171 yards, so Brees might be primed to go back to him in heavy doses this week.) Cornerback Marcus Peters was the closest defender on the majority of Thomas’s catches back in November, so his performance Sunday may go a long way toward determining whether the Rams fare better the second time around. There are plenty of other storylines to watch, of course, including a potential passing of the quarterback torch from zombie geezers Brady and Brees to young guns Mahomes and Goff. Add everything up, and it should make for one of the most entertaining pair of games we’ve seen all season, with a couple of tickets to Super Bowl LIII on the line. 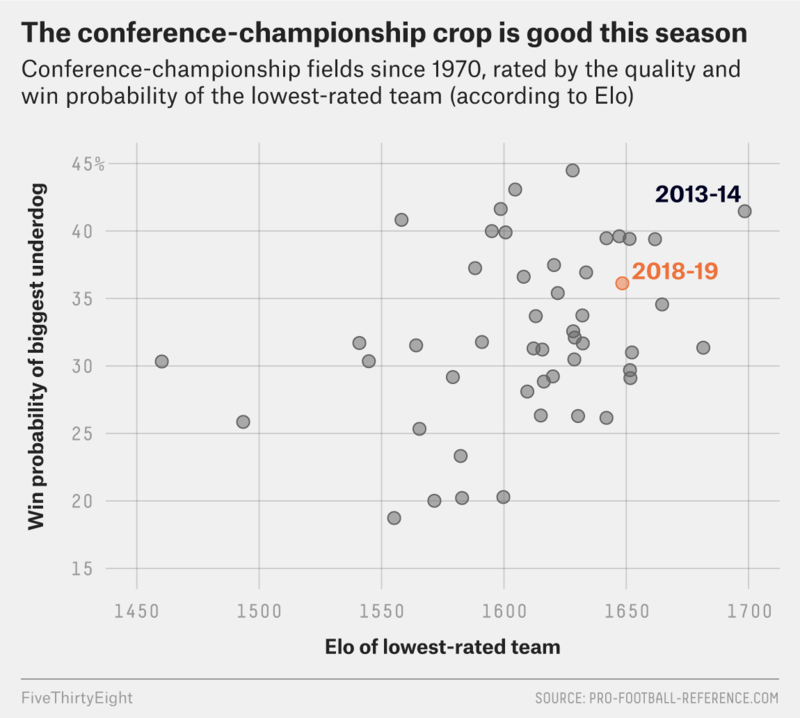 As you’re following the playoff action, please be sure to check out FiveThirtyEight’s NFL predictions, which use our Elo ratings to simulate the rest of the postseason 100,000 times, tracking how likely each team is to advance to the Super Bowl. You can also pick playoff contests against the Elo algorithm in our prediction game and keep climbing up our giant leaderboard. Anyway, congratulations to reader “Ellis,” who leads all users in the postseason with 276.4 points, and to Neil Mehta for another week in first place on the season, this time checking in with 1,275.9 points. Thanks to everyone who has been playing — and the game isn’t over yet! You should keep making picks and trying your luck against Elo throughout the playoffs. The other was in 2015-16. If not twice previously, as in the cases of the 1992 Bills and Dolphins, 1999 Titans and Jaguars, 2008 Steelers and Ravens, 2010 Packers and Bears, and 2013 Seahawks and 49ers. 20 times in 32 tries. Or an 88.3, if you want to use the better version of passer rating we laid out here. L.A.’s defense ranked second to the Jaguars this season in pressures per dropback. They were also tied for third in total interceptions.